I admit it – I don’t read enough! (books that is). It’s not that I don’t like reading – I love it, but the fact of the matter is that I very rarely find the time to read a whole book from cover to cover. I’m one of those people that once a book grabs hold of me I can’t put it down until I’ve finished it, so I reserve reading page turners for holidays and long weekends. But it is why I enjoy gardening books so much – I can read bits and pieces that interest me, put the book to one side and then grab hold of it again when I want to learn more about a particular subject. So it was with some trepidation that I agreed to take part in the Earth Day Reading Project initiated by The Sage Butterfly. When I received my invitation to participate from Donna of Gardens Eye View, my initial enthusiasm was followed by thoughts of “how am I going to read 3 books from cover to cover by the 23rd April AND write something interesting and meaningful about each of these books?”. And “what if I buy three books and none of them actually inspire me?”. I finally settled on two books I already have in my “library” of gardening books and, a slight deviation from the rules, a magazine I read every month. 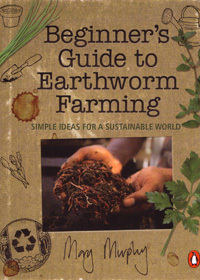 Beginner’s Guide to Earthworm Farming – Simple ideas for a Sustainable World – by Mary Murphy (published by Penguin Press – Non Fiction): I had ideas about starting my own “Earthworm Farm”. So I bought the book. I still haven’t started my Earthworm Farm (my soil is laden with earthworms) but this book inspired many changes in the way I think about the health of our planet. From an attitude of “Its not my problem”, my thinking was radically altered and I have become environmentally concerned. 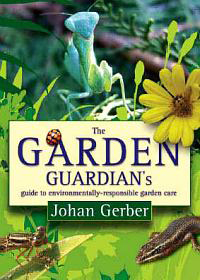 Garden Guardian’s – Guide to environmentally responsible garden care – by Johan Gerber (published by Aardvark Press – Non Fiction): What impresses me the most about this book is the author! A registered professional natural scientist, Johan Gerber worked in the actual harmful pesticide industry before he switched tack and started working with various leading agricultural companies in the development and registration of many of the environmentally-responsible pest solutions now available on the South African market. His philosophy is that pest control need not be at the expense of the health of the environment, or of people and animals. In a nut-shell, the book is an exploration of the dangers and health implications of using conventional pesticides in the home environment and provides solutions for handling conventional poisons and methods of disposal. This book incorporates the best illustrated guide to pests and diseases that I have seen to date. Even an idiot-newbie gardener like myself can actually identify most pests and diseases using this guide and of course the best part of the book is that Johan gives us solutions and methods for controlling pests and diseases that will not harm our planet! This book has become my “Gardening Bible” and I won’t bring any pesticides into my home or garden that he does not mention and approve of in this book. 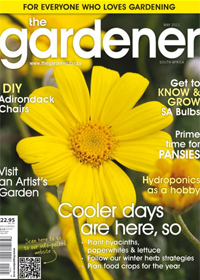 The Gardener – The South African Magazine for everyone who loves gardening – Editor: Tanya Visser: I started buying this magazine occasionally when I bought my house four years ago and when I got serious about my gardening hobby about a year ago I started to buy it regularly. I recently became a subscriber so that I can get it before it hits the news stand because I love this magazine. I have learnt more than you can imagine by absorbing their articles every month. From becoming water-wise to planting more indigenous plants to companion planting and organic gardening … a lot of what I practise in my home and garden these days, that can be considered environmentally friendly, comes from this magazine. Most of all the magazine inspired me to try my hand a growing my own vegetables which I have been doing now for close on two months with great results. If that helps to reduce my “carbon footprint”, then I believe it has been a very worthwhile exercise. And we’re loving eating our own produce in my home! In Conclusion: I’m still not entirely where I need to be as far as “caring for the environment” goes. I have plans to start an Earthworm Farm (one day! ), we are getting solar panels in the not too distant future and a rain collection tank is on the cards for later in the year. For now we are growing some of our own vegetables, not watering as often as we used to, recycling, composting and most importantly … NO harmful pesticides are used in my garden. Ever. As per the rules of the Earth Day Reading Project I invited three Garden Blogging friends to participate. Two responded favourably, one of them did not respond at all which made me rather sad. So to fulfill my obligation in taking part in the Earth Day Reading Project Meme, I am still looking for one more Garden Blogger to take part. If you would like to take part, all posts should be completed by midnight EDT on April 23, 2011 – please click here for all the details and let me know so that I can link to your post from here. My special thanks to Donna from Gardens Eye View for inviting me to participate and thanks to Holley from Roses and Other Gardening Joys and to Alan from It’s Not Work, It’s Gardening for accepting my invitation to participate. Christine, my journey has been similar to yours in learning about how harmful seemingly innocent actions can be to our environment. I love the idea of the 2nd book in that he “switched sides” so to speak and is now educating corporate folks about how to be more earth friendly. Sounds like a wonderful book. This is such a great initiative! Well done ALL of you! You know I’m a big “love your Earth” person and practice good habits – I compost all my kitchen waste, I plant all vegetables organically and I have a worm farm and if you don’t add fruit cuttings into your worm farm you should have no fly maggots and smells. I only use vegetables, paper, tea bags and things like this. The rest I put into the composter. I want to collect rain water still AND I have just planted 2 new trees! I’ll be posting this today! Happy Earth Day! Great post! I enjoyed reading why these books were your picks. And a magazine is a fine choice. I will have to give The Garden Guardian’s Guide to Environmentally Responsible Garden Care a look. It sounds like it contains a wealth of good information. Thanks for joining in and Happy Earth Day! Thanks Sage Butterfly for including us in this project! It was a privilege to be able to take part in this great meme! I just used books that I’ve already read. I’m not sure that the “rules” indicated they had to be new books. Plus if I broke the rules then it just reinforces my “rebel gardener” image. Also, not fair choosing South African books that we northern hemispherians can’t get. Hi Christine – my sincere apologies for not being able to accept your invitation. Things have been hectic my side with financial year end and there was no way I could complete this reading before 23 April. I, too, am a big fan of The Gardener – Tanya Visser is brilliant!